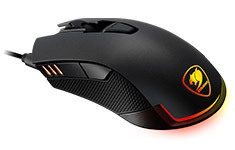 The Revenger Gaming Mouse is COUGAR's newest take on what the ultimate gaming mouse should be. Starting with its state-of-the-art PMW 3360 optical sensor which brings unrivalled accuracy and reliable performance. Every single detail in this gaming mouse has been specifically designed to optimise your gaming performance.